Objective : To trace hystersis curves on cro using resistance, capacitance & inductance. Features : Instrument comprises of ac power supply 10-30 vac, output selectable using band switch, circuit diagram for bh curve printed, components connected behind the front panel, input & output connections brought out at sockets. 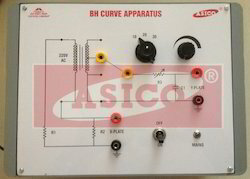 We are engaged in offering a quality tested array of BH Curve Apparatus. To Trace Hysteresis Curves On CRO Using Resistance, Capacitance & Inductance. To trace hysteresis curves on CRO using resistance, capacitance & inductance. 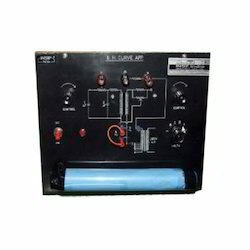 - Ac power supply 10-30 VAC. B.H. Curve Apparatus Objective: To trace Hysteresis curves on CRO using Resistance, Capacitance & Inductance. Power requirement: 230 VAC 10%,50Hz. We offer a good quality and highly efficient BH Curve Apparatus. These BH Curve Apparatuses are made using high grade raw material. Owing to the sound industry experience, we have been successful in catering to the requirements of our esteemed clients by offering B.H.Curve Apparatus. In this instrument, terminals are provide for x & y plates. Customization of our range is also offered by us in order to meet the requirements of varied clients. - Junction Diode: A P.N. Junction diode on Board with diagram engraved on front panel.